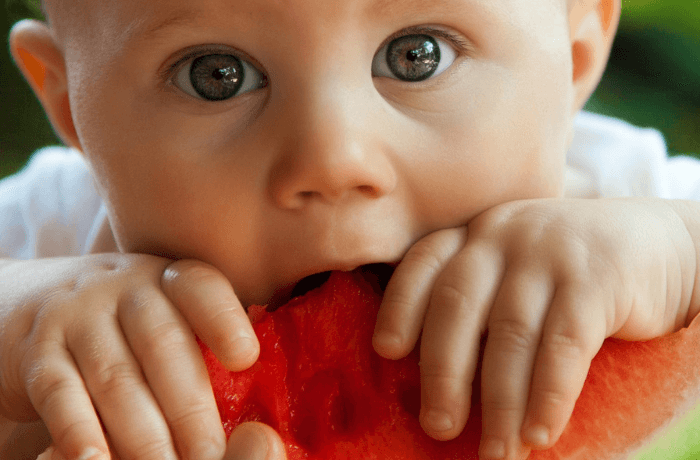 Should my baby be starting on solids? Is it time for Solid Food? Every mother reaches the point with her infant at which she wonders if her little bundle of joy is still hungry. Babies are very vocal about their needs, and crying usually means one of very few things. I am sick. Change my nappy. I am sleepy. I am hungry. At around 4 – 5 months old, some babies seems to just not be satisfied with good old formula or breast milk, and many moms opt to incorporate rice cereal or fruit into their diets. The recommended age for introducing solids is believed to be 6 months, according to the World Health Organisation. A new study says many parents are starting too early. Experts weigh in on when to start solids and what to start with. According to Parents.com, The American Academy of Pediatrics (AAP) says to wait until about 6 months if you’re exclusively breastfeeding, while the American Academy of Allergy, Asthma, and Immunology says 4 to 6 months is okay. Babies often show signs that they are ready to eat. If you answer yes to these questions and your pediatrician agrees, you can begin supplementing your baby’s liquid diet, Mayo Clinic reports. When it comes to babies, having a great medical insurance plan or medical aid plan is vital, so that you can get the best advice from leading experts. But what can happen if you start to early? It is an old wives tale that you could irreparably damage a baby’s digestive system. That does seem like quite a scary prospect, especially for first time moms. Starting solid foods too late also comes with its own set of disadvantages. Whatever you decide, speak to a licensed professional so that you can make the best, informed choice for your baby and you. She continues, “ This is a new concept. Apparently it also helps to delay the onset of food allergies in children”. “The type of foods we try to encourage are things like fruit, or vegetables that have been steamed. They should be blended to a softer, smooth consistency and are easier for baby to swallow”. Dr Shire Karan Singh is a specialist paediatrician who is passionate about children’s health and development. She is known for building ongoing relationships with each of her young patients. Doctor Singh is based in Bergbron, Johannesburg. Her qualifications include Fellowship in Paediatrics (SA), A Master of Medicine Degree, specialising in Paediatrics from Witwatersrand University and a diploma in HIV Management (SA). Prior to establishing her own practice, Dr Singh lectured paediatrics at The University of Witwatersrand in Johannesburg. Dr Singh has an independent practice which offers services from general health checks to emergency appointments. DR SHIRE SINGH, Specialist Pediatrician.